THE JOURNEY TO THE STAGE IN THE MARKETPLACE. A recourse to the many posits of the elders is often required to give us a better view of our current state. Some say “The world is a stage and we all are actors, we play our roles and we go away”. Some on the other hand believe that “Life is a journey, starting at birth and ending at death; getting to the end isn’t the aim, but what happens between the two opposites”. Others still go ahead to say “The world is a marketplace, we all come to the market to do/get something, and when we are done, we leave”. While there are hardly ever any absolutes, I’d say these statements are to a very large extent true. And if we view them together, we’d learn a thing or two. (Dyu see d rhyme there??? Hehehe). I hope the topic now makes sense. Lego! If you’ve ever been lucky to have seen or been in a stage play, you should be able to connect with this more. And those of you that haven’t….you sure are missing. The stage dramas are the real deal, no camera effects, no film tricks, no ‘ahn ahn see lie’ moments like the ones you find in that 2008 movie featuring Angelina Jolie – Wanted. It’s the purest form of the performing arts and the soul of true expression. What you see on TV doesn’t even come close. Let’s expand our horizon and see the world as a theatre house and define all roles. 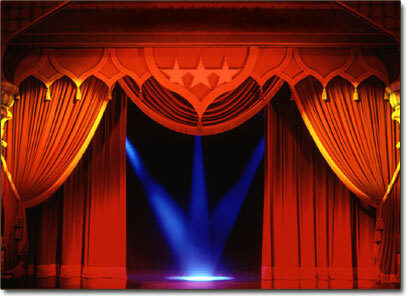 First, who owns the theatre house/stage? Since we’re paralleling the world with the stage now, Beyonce’s “Who runs the world” comes to mind…but I digress. Who owns the world isn’t the same as who runs it. I believe in the existence of the Supreme Being and I would say that the theatre house belongs to him, so if we were to draw the hierarchy, who’d be next? The board of Directors of course; which in this case would be the Trinity – God the Father, the Son and the Holy Spirit. They define the goals of the organization. Long term and short term goals, they also control resource allocation and empowerment. They are the Ogas at the top! Wherefore we must agree that they are essential. Next we talk about the producer. Every production has a producer, director, script writer. These three roles can belong to one person. The script writer can produce and direct his drama better because he wrote it. But to be the three, he’d have to be that trained. Not just anybody can be the producer, and director without appropriate and adequate training. These two people have control over the production. They are involved in everything that makes the production tick, from character selections to advertisement. If you put someone not qualified to handle those roles in position, you have potential trouble on your hands. So if you want to write your life’s script, produce and direct it, and want it to come out good in the end, you’re going to want to take responsibility of making that happen. This means it has to be done according to the pattern set by the board of directors; with as minimal deviations as possible unless you want to lose your job that is. This is important because at the end of the play, when your performance will be reviewed, the audience wouldn’t be there, it’ll be in front of The Board, so you want to do things to their satisfaction. Follow the rules and you’ll be safe. It should be there in you welcome package. In case you’re still wondering, that is your Bible. Live according to it and you’d have no scuffles with The Board. Next should be the script itself. Is it a comedy, thriller, action series, sci-fi, romance, tragicomedy or an inspirational one? First thing you should know is that you choose. While the guidelines for crafting an absolutely fabulous story are placed in your hands, you honestly don’t have to use it. You are advised to, but many refuse, wanting to do it their own way cos the one in the book is so narrow and not easy. Forgetting that the book also says, “there is a way which seems right unto a man, but the end thereof is destruction” you can choose to walk to the road’s end (which there is no return from) and see if indeed there is destruction there or be the child that pays attention to instructions and follow the guidelines. So what kind of story are you writing with your life? Will it be a worthy read when you’re gone? Will someone pick it up and emulate, or even better your achievements or will it be read as a warning to kids of what not to be like? Like I said earlier, it’s all your choice. I’d say choose wisely, cos a good name is worth more than silver or gold and the end of a matter is always better than the beginning thereof. So if you’ve started on the wrong foot, fret not for you can still edit this tale and change its course. The characters should be next right? Are you the Hero or Heroine in your own play? Please don’t write a story and be the House girl in it o. It’s not fair to you. Live to your maximum potentials. We don’t want you regretting on your deathbed and wishing you’d done things differently. Now that you still can, go ahead and do it. Make hay while the sun shines, even the evening sun can still make hay. Well as for me, I won’t accept less, I am the Don One of this Plot. The Overlordnoni, the one and only Agajamapatawada on this plane; The Ogbuefi 1! And to that end, I will live my life as such; the hero of my production. What about you? Who are you in your play? Please I beg you, don’t be the gateman, be the Lord of the Manor, the High flying successful hottie, the life saver, and what have you. Be it cos you can! It’s in you! There will always be extras, the cleaners, stage hands, costume manager, props handlers, lighting engineers, make up artists, the camera crew, director of photography, stunts coordinator(if your own na action film), the person in charge of music. All these roles are important in the outcome of the production. Surround yourself with capable hands, and it will show in your results. In case you haven’t connected it yet, these people are your friends and the people you allow on your stage. The kind of friends you surround yourself with will influence how ur production comes out. Like I said earlier, you choose. Some people come into your life at certain times to teach you certain lessons in life, but otherwise, you’re in control of your affliations. Choose wisely and you’ll be fine. What did I miss? I want to believe we have the major ones covered. And I hope we’ve learnt something. Life is a journey comes up next. Thank you for reading always.